The capital of the Czech Republic, is its most valuable historical city reserve. In 1992 the historical core of the city covering 866 hectares was listed in the UNESCO World Cultural and Natural Heritage Register. Since its beginnings Prague has always played an important role in the history of the nation, the country and Europe. 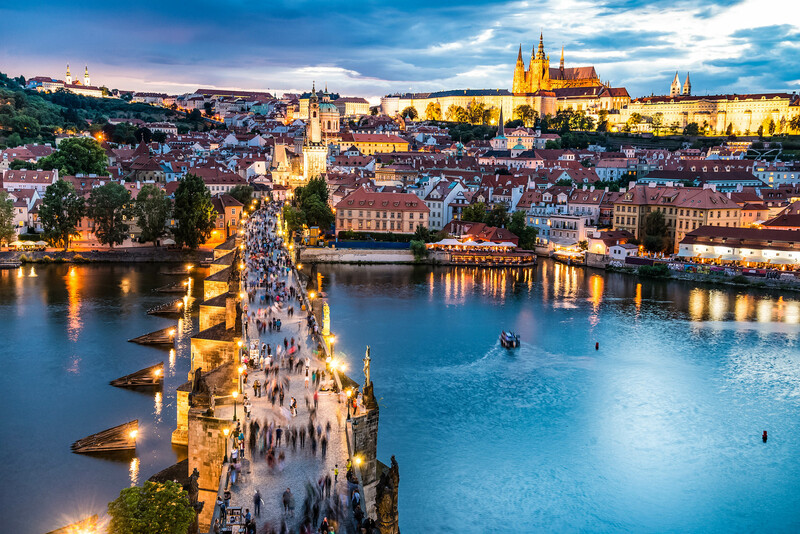 Since the Middle Ages Prague has been famous as one of the most beautiful cities of the world, and has been attributed adjectives such as „golden“, „hundred-spired“, „the crown of the world“, „a stone dream“. The Oldtown Square with its dominants - Church of Virgin Mary, House at Stone Bell and Oldtown Hall - is a natural center of the Old Town. Hundreds of tourists admire every hour the moving statues of the apostles on the astronomical clock at the tower. Prague represents a unique collection of historical monuments dominated by the Prague Castle which towers high above the city. It is a specimen of all artistic styles and movements. The historical core of the city is situated on both banks of the Vltava river and consists of 6 parts - formerly independent urban units unified in the 18th century. They are as follows: Stare Mesto (Old Town), Josefov (the preserved part of the former Jewish Town - today a part of the Old Town), Nove Mesto (New Town), Mala Strana (Lesser Town), Hradcany and Vysehrad. Naturally, most of the historical monuments, museums and galleries are concentrated right there. Throughout centuries prominent personalities paid homage to it. W. A. Mozart, L. van Beethoven, F. M. Dostojevsky, A.Rodin, G. Apollinaire, P. I. Tchaikovsky, O. Kokoschka and also the British Queen Elizabet II and Pope John Paul II professed their beguilement by its attractiveness and architectural beauty. The native town is reflected in the works of Jan Neruda, Jaroslav Hasek, Jaroslav Seifert, Franz Kafka, Max Brod or Egon Erwin Kisch. The most beautiful views of the city Smetanovo nabrezi (embankment) - Novotneho lavka, the Old Town Hall Tower, the Powder Tower, the Old Town Bridge Tower, the Lesser Town Bridge Tower, St. Vitus, St. Wenceslas and St. Adalbert Cathedral Tower, the Prague Castle ramp on Hradcanske namesti, Petrin View-Tower, Letna Park - Hanauer Pavilion, belfry of the St. Nicholas church, Zizkov TV tower, Vysehrad.